Hall, Richard & Winn, Joss (eds.) (2017) Mass Intellectuality and Democratic Leadership in Higher Education. London: Bloomsbury. Adorno (1969/1998) Education after Auschwitz. We demand real money now for the schoolwork we do. We must force capital, which profits from our work, to pay for our schoolwork. Only then can we stop depending on financial aid, our parents, working second and third jobs or working during summer vacations for our existence. We already earn a wage; now we must be paid for it. Only in this way can we seize more power to use in our dealings with capital. We can do a lot with the money. First, we will have to work less as the “need to work” additional jobs disappears. Second, we will immediately enjoy a higher standard of living since we will have more to spend when we take time off from schoolwork. Third, we will raise the average wage in the entire area affected by the presence of us low-cost workers. By taking time off from schoolwork to demand wages for students, we think and act against the work we are doing. it also puts us in a better position to get the money. Read the full pamphlet on Zerowork (download PDF scan of 1975 original). See also here and for historical context, Federici (1974) Wages Against Housework. Author Joss WinnPosted on July 30, 2014 Categories NotesTags academic labour, Education, Federici, Higher education, labour, Wage for Students, Wages Against Housework, work, ZeroworkLeave a comment on Wages for Students! Just a final reminder that the Social Science Centre is hosting a free conference on the theme of ‘Co-operation and Higher Education’, April 26th, 10.30-4.30pm, at The Collection, Lincoln’s museum and art gallery. What is different about common ownership to joint stock ownership (neither of which are private forms of ownership) is that common ownership socialises ownership of the means of production among its workers. It is held in trust for future generations of co-operatives. Whereas the joint stock company is “private production unchecked by private ownership”, a workers’ co-operative is social or collective production governed by social or common ownership. Common ownership of the means of knowledge production among scholar-members is also therefore a significant step towards a form of academic labour that is not alienated from its product. In his talk on Marx’s alternative to capitalism, Peter Hudis (around 37 mins in) summarises what Marx deems necessary to eliminate the conditions of alienating value production i.e. freely associated, non-alienated labour. Extend democracy into the economic sphere, into the workplace. Workers’ co-operatives. Direct ownership stake and control of the workplace. Eliminate the social division of labour between ownership and non-ownership. Workers have a direct stake in the outcome of labour. In control of the workplace, workers would make work less alienating, less harmful. Co-ordination between co-operatives is needed, nationally and internationally. Democratically elected planning authority, subject to recall. 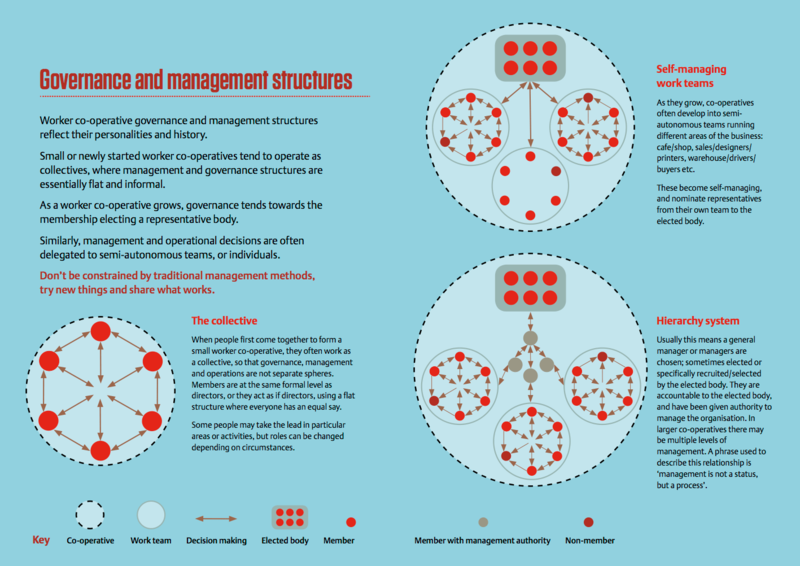 Depending on the size of the co-operative, governance might be structured in different ways. The Social Science Centre is intentionally small, an experiment that is intended to be replicated rather than scaled up. Mondragon limits the size of its worker co-operatives to 500 members. If the ‘co-operative university’ is to be constituted and governed as a worker co-op, it is likely to be smaller than existing universities. A variation on ‘self-managing work teams’ (see illustration) seems appropriate to a university and reflective of the semi-autonomous quasi-firm characteristics of many research groups that already exist. Committee structures could reflect this form of governance, too, rather than a hierarchy of committees as is currently the case. Click to enlarge. Image taken from ‘The worker co-operative code’. The educational mission of the co-operative university is to be determined by its scholar-members. However, based on the history of education in the co-operative movement, we can identify certain themes and practices in the overall curriculum that would effect all its members. Teaching about co-operation – making visible the alternatives and challenging the social and economic status quo. Training for co-operation – building co-operative institutions and skills as economic and social resources. Conversion – systematically convert the values, principles and legal form of an existing university to that of a formally constituted co-operative. Dissolution – dissolve the ‘neoliberal university’ into a co-operative university by creating co-operatives inside the existing university form. e.g. constitute research groups on co-operative values and principles; design, specify and validate modules and degree programmes so that they embed co-operative values and principles; if necessary, outsource services to an increasing number of co-operative providers; establish the terms of reference for new committees on co-operative values and principles. Continue until the university is effectively transformed into a co-operative organisation from the inside out. Creation – build a co-operative university from scratch in the same way that a new co-operative enterprise might be established. If Co-operatives UK, or the International Co-operative Alliance agreed to support the creation of such co-operatives for higher education, it could do so based on the principles of ‘democratic member control’ and the ‘autonomy and independence’ of a community of worker-scholars. It would not award government recognised degrees, but it could provide an education at the same level and confer awards that carry meaning, currency and weight beyond the institution. In a worker co-operative for higher education (i.e. a ‘university’), we might call workers, ‘scholars’. This does not mean that they are not workers, that they do not work, but is meant to signify (and dignify) the kind of work undertaken by the members of the co-operative. It is also intended to be general enough so as to be inclusive of all types of necessary contribution to the co-operative: teachers are scholars; students are scholars; administrators are scholars; cleaners are scholars; technicians are scholars; caterers are scholars. However, whether these distinct and divided responsibilities remain in a worker co-operative university is to presume the content of the organisation before agreeing its form. To refer to all members as scholars and all scholars as members is one way in which equity among members is constituted. Whereas in a capitalist university, there is a great diversity of roles and their respective contractual responsibilities (e.g. Senior Lecturer, Professor, Administrator, Undergraduate Student, IT Officer, Finance Officer, etc. ), such a division of labour in the institution ensures that the diversity of work within any given role is limited. In a worker co-operative university, as I am conceiving it, there is a singular role of ‘scholar’ but a greater diversity of work and significantly less division of labour. Labour is not divided but is instead communal and direct. According to the individual’s capacity, the teacher is also a student, an administrator, a cleaner, and so on. The most capable members will make the most diverse and therefore enriching contribution to the university. This is not to suggest that the most capable scholars should be ‘over-worked’, burdened with menial work, or that everyone does everything. With a greater number of members partaking in undesirable but necessary work than is ordinarily the case, ‘light work’ would be made of such tasks and it is expected that more time would be available for enjoyable, satisfying and less alienating work. Also, a co-operative university need not do everything that a modern university aims to do. This brings me to a point which I will elaborate on at a later date: the organisational form should be an expression of the pedagogical relationship between teacher-student-scholar-members i.e. ‘scholars’. The pedagogical relationship is a social relationship which, if appropriate, is given expression through a co-operative constitution. Kasmir (1996) makes this point in her reflections on the ‘myth of Mondragon’, arguing that we must “be skeptical of models that make business forms rather than people the agents of social change.” (p. 196). The relationship between teacher and student (i.e. scholars) is one of the core principles of Student as Producer, which I will return to soon. “Speech Introducing the Co-operative Identity Statement to the 1995 Manchester Conference of the ICA”. This is published in MacPherson’s One Path to Co-operative Studies, on pp. 201-17. “The International Co-operative Movement Today: the Impact of the 1995 Co-operative Identity Statement of the ICA”, which can be found on pages 255-273 of the same book. All of the above texts have formed part of this term’s Social Science Centre course, ‘Co-operation and Education’. Peter Hudis’ PhD thesis (in particular pp.256-264) provides a good discussion on joint stock vs. common ownership in the context of Marx’s writing on worker co-operatives. Articles relating to Student as Producer can be found here, under ‘articles’. I am also maintaining a bibliography specifically about co-operative higher education. UPDATE (01/02/2011): This idea is now developing into an autonomous Social Science Centre. Click here for the website. The university has a staff suggestion scheme that rewards good ideas from staff. I’ve just submitted a proposal to the university for help in setting up a Social Science Centre. This is based loosely on an unsuccessful bid to HEFCE that we made a couple of months ago to develop an ‘academic commons’ of sustainable, co-operatively run centres for higher education, somewhat based on the Social Centre model. Initially, as you’ll see below, we’re proposing that courses are run in existing public spaces, with a view to buying or renting a city-centre property further down the line. Attached to this (preferably on the premises) would be some kind of co-operatively run business (I like the idea of a decent bakery – you can’t buy real bread in Lincoln), which would bring in an income to help cover running costs and act as a way to connect with local residents apart from and beyond the educational provision of the Centre. Anyway, here’s a brief overview of the idea which we’re keen to develop over the next year. If you’re interested and in Lincoln, then a few of us are meeting In Lincoln at 5pm on the 25th September to discuss the practicalities of this idea further. Members of the Cowley Club and Sumac Centre will be there to talk about their experience setting up their respective Social Centres. Email me for more details. The proposal is that the university support the development of an independent Social Science Centre in Lincoln. The Social Science Centre will offer credit bearing courses in Sociology, Politics and Philosophy, programmes not currently available as part of the University of Lincoln’s portfolio. A key aspect of the Centre is that students would not pay any tuition fees. The Centre would be community based, utilising already existing public spaces in Lincoln, e.g., libraries, museums, schools, community centres. The Centre will be ran as a co-operative, involving local people in the managing and governance of this provision. The courses will be provided by academic members of the co-operative on a voluntary basis. The role of the university will be to provide accreditation for the programmes and an advisory role in establishing the centre as well as an ongoing supportive input. There will be no direct ongoing costs for which the university will be liable. An important principle for the Centre is that it is sustainable and, for that reason, the number of students will not exceed twenty in any academic year. It is intended that this model of sustainable, co-operatively run centres for higher education will act as a catalyst for the creation of other centres for higher education.